Chicago has a rich history of diverse music traditions. Best associated with Jazz and Blues, the city also can boast being home for one of America’s finest symphony orchestras and a world class opera company. Yet it might pleasantly surprise many that Chicago is also a hub for folk music including ethnic and world genres. Chicago hosts a live and vibrant folk and roots music tradition. At its epicenter is the Old Town School of Folk Music. Founded by Win Stracke, a music promoter and entrepreneur, and Frank Hamilton, a music instructor, Old Town celebrates its 50th year in December. Since opening its doors in 1957, a gifted array of artists have performed on its stage including Pete Seeger, Mahalia Jackson, Steve Goodman, The Byrds, John Prine, and Arlo Guthrie. Old Town’s mission has always included instruction and performance of folk traditions, a music experience for everyone. Yet Old Town has wisely broadened the definition of folk to include everything from African folk to Klezmer to Tuva throat singing. 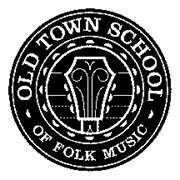 Old Town’s musical offering reflects a diversity of music traditions. At times, the changing currents open new possibilities of sound. Case in point is the renowned Klezmer ensemble, the Klezmatics featured in concert on January 28, 2007 at Old Town with guest Irish singer Susan McKeown. The performance, like a good meal, featured the nourishing main course, material from the Klezmatic’s Grammy-winning album Wonder Wheel with lyrics by Woody Guthrie. The repast was sweetened with delicious desserts of traditional doinas and freylekhs. The core and strength to this great Klezmer ensemble includes Matt Darriau on kaval (a Balkan flute), clarinet, and saxophone; Frank London trumpet and keyboards; Lisa Gutkin voice and violin; Lorin Sklamberg on accordion and vocals; and Paul Morrissett on bass and tsimbl. The Klezmatics are remarkable musicians that truly enjoy playing together. So why is an eminent Klezmer band playing original folk material with lyrics by Woody Guthrie? The Klezmatics, since their early days, have joined creative forces with a variety of music sources and traditions yet always have maintained a foundation in their Yiddishkeit, Jewishness. The impressive list of collaborations includes legendary violinist Itzhak Perlman, Israeli folk star Chava Albertstein, and contemporary composer John Zorn and a recent collaborative relationship with members of the Guthrie family. Nora, Woody’s daughter and Director of the Woody Guthrie Archives was instrumental in inspiring the Klezmatics to set several previously unknown poems and lyrics to music. As Frank London explained Nora Guthrie opened a new world of material including surprising Chanukah lyrics written by Woody. The Klezmatics recorded Guthrie’s spirited "Happy Joyous Hanuka" and other Hanuka songs by Woody (yes, there are many ways to spell Chanukah) on CDs of the same name (2004, in a limited edition) and (2006, expanded to include additional Guthrie songs and some klezmer tunes). The Guthrie Family moved to Mermaid Ave, Coney Island, New York in 1940’s. Besides hosting the famous amusement park and beach, Coney Island was home to many first generation Americans including a large Jewish community. Woody the ‘Coney Island Okie’ took great pride in Coney Island’s cultural diversity as reflected in the joyous life affirming lyrics and poems written during the period. The Klezmatics, in their enthusiastic and energetic style, have set this material to music which is sensitive to the spirit of the Guthrie legacy. The addition of Susan McKeown to the band reflects this sensitivity capturing a convincing folk sound. Her voice is pure, direct and clear. McKeown supplies heart for the Irish/English type ballads on Wonder Wheel, including "Come When I Call You" and "Heady Down." The later includes a beautiful a capella section featuring the penetrating voices of McKeown, Lisa Gutkin and Lorin Sklamberg. 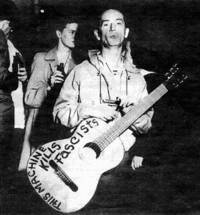 "Come When I Call You" is a powerful anti-war song. It saddens the spirit that we still have not learned lessons from the past. There is holiness at Sinai and places as remote as the streets of Coney Island. We need only to pause to see it. The confluence of Old Town and folksy incarnation of the Klezmatics is indeed a delight to the senses. "Wonder Wheel" is welcome new direction in the world of Jewish music. This page is maintained by Ari Davidow. E-mail Ari Davidow with any comments or suggestions. Last revised 08 August, 2007.